Maximilian Wied was a 19th-century German explorer known for his expedition to Brazil in 1815. While on South America, Wied encountered native Brazilian Indians and illustrated these peoples in his book ‘Travels in Brazil’. This work was the first work to illustrate Brazilian natives and covered their habits and customs. 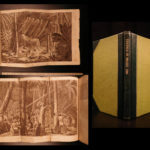 This 1820 English edition features the same Karl Bodmer illustrations as in the original German printing. 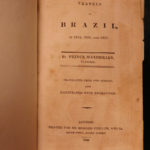 Travels in Brazil, in 1815, 1816, and 1817. London: Printed for R. Phillips, 1820. First edition thus.